Doug Hansen was born in Fresno, California, and is the eldest of six children in an artistic family. 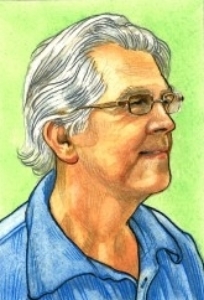 Doug has worked as a Fresno Bee newsroom artist, freelance illustrator, and cartoonist. He wrote and illustrated Mother Goose in California, Aesop in California, and California, the Magic Island for Heyday. He also illustrated David Mas Masumoto’s books Letters to the Valley: A Harvest of Memories and Heirlooms: Letters from a Peach Farmer. He teaches illustration at his alma mater, California State University, Fresno.